Traditionally, festival breads were prepared to denote a special observance of religious or national importance. Some breads were made only once a year, while others were baked weekly, however many of the once-a-year breads are now being offered year round by a greater number of commercial bakers. Most festival breads are made with many ingredients that enrich and flavor the bread and the preparation is often more time consuming for the home cook than other types of bread. Description: A Portuguese yeast bread that is traditionally served to celebrate Epiphany. The dough is enriched with butter and eggs, flavored with raisins, pine nuts, and orange and lemon zest, and topped with candied fruits, sugar, and citrus zest. It is formed into a large ring shape and baked until golden. It is the custom to insert a dried bean and a small coin or gift into the dough before baking. Whoever receives the slice of bread containing the bean is the person designated to make the bread the following year. A similar recipe known as "Twelfth Night Bread" is the Spanish version of the bread. Description: Challah (pronounced hal-la) is a traditional Jewish festival bread served on the Sabbath and on several religious holidays. The bread has a golden color, soft texture, and a slightly sweet flavor. Challah is made from a white flour yeast dough enriched with eggs, oil, and butter and sweetened with a small quantity of honey or sugar. The most characteristic features of the bread's appearance are the braided shape and the poppy seeds covering the top. The dough is divided into three, six, or twelve strands that are braided together before baking. The strands represent truth, peace, and justice. For the holiday of Rosh Hashanah, the bread is often formed into a round shape to symbolize the cycle of life or the cycle of the years. On the eve of Yom Kippur, the bread is made into various shapes including a ladder, wings, or the shape of raised arms, which all symbolize prayers rising to heaven. Since cooking is not allowed on the Sabbath, it is common to bake two loaves before the beginning of the Sabbath (sundown on Friday) so that the bread is available during the observance of the Sabbath. When the bread is served, it is often placed in the middle of the table becoming a centerpiece of the Challah tradition for the Sabbath commemoration. When eating Challah, it is customary to break off small rounded pieces from the braided loaf instead of slicing it. Description: A type of festive Easter bread that originated in Bologna, Italy. The bread is enriched with butter, eggs, and milk, sweetened with sugar, and flavored with lemon zest. It features a decorative topping of toasted almonds, cinnamon, and sugar that provides a crunchy texture on the surface of the bread. The bread is formed into a twisted rope, which is then shaped into a large ring or wreath shape. The bread is so popular in Italy that it is usually found in bakeries year-round. Description: A type bun prepared with yeasted dough that is enriched with milk, butter, and eggs. The distinctive feature of the bun is a cross of frosting added to the baked bun after it is cooled. The cross is also formed by slashing the dough prior to baking and then after cooling, the cross may or may not be filled with frosting. The cross was originally intended as a symbol to ward off evil spirits, but evolved into its current symbolism of the Lenten season, so consequently hot cross buns are most often served during Lent. 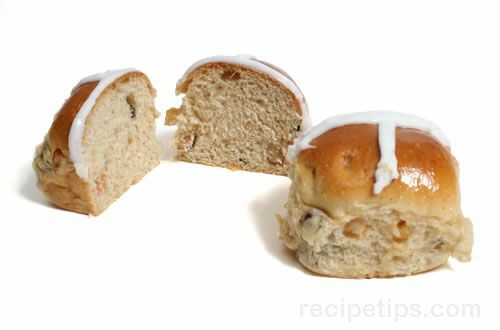 There are many recipes for hot cross buns. Some are served plain, while others are flavored with honey, candied peel, currants, raisins, and other dried fruits. The buns were traditionally prepared with a variety of spices including nutmeg, cinnamon, mace, and/or cloves. Description: A Christmas bread that originated in Denmark. The bread is made with white flour, enriched with eggs and butter, and flavored with cardamom, vanilla extract, and lemon zest. It is loaded with chopped dried and candied fruits, such as dried apricots, dried dates, red and green candied cherries, candied pineapple, and golden raisins, which have the appearance of jewels scattered throughout the bread. Almost any type of dried or candied fruit can be used. The bread is usually formed into a round or loaf shape and is usually topped with nuts, such as almonds, walnuts, or pecans, and sprinkled with sugar before baking. Some versions are frosted after baking and may or may not be topped with nuts. Description: A festive American bread that is a traditional part of the carnival season and the notable Mardi Gras celebrations. The King Cake arrived in New Orleans with the first French settlers and has remained to this day. Baked in the shape of a circle to represent the unity of Christianity, the bread is decorated with icing and colored sugars denoting the three Kings who visited the baby Jesus on the 12th day after Christmas, the day of Epiphany. A small figure of the baby Jesus is placed inside the bread and the person receiving the piece of bread containing the figure is the one responsible for making the King Cake the following year. 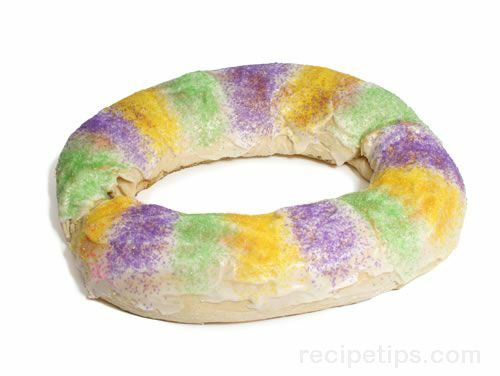 According to tradition, the King Cake can only be prepared between Epiphany on January 6th, when the carnival begins, until the first day of Lent. Over time, people have developed their own variations for this bread including different fillings and toppings, but the selection of colors for the topping is always purple, green, and gold, which represent justice, faith, and power, respectively. The bread itself is made from a yeast dough of bread flour or all-purpose flour. European breads that are similar to King's Cake include Twelfth Night Bread from Spain and Bolo-Rei from Portugal. Description: A type festival bread that traditionally is served on Russian Easter. The white flour yeast dough is most often enriched with eggs, milk, and butter. Flavoring ingredients such as candied fruit, raisins, candied zest, and saffron are also incorporated in the dough. Many years ago, the bread was baked in special cylindrical pans that gave the bread its characteristic stovepipe shape. The pans are still used today; however, coffee cans are most often used because of their availability and economy. Many Russian bakers place the letters XV on the top of the loaf, which symbolizes, "Christ is risen." The letters are formed in several ways: from pieces of dough, formed into the proper shapes and placed on top of the loaf prior to baking; with frosting piped from a bag after the bread is baked, cooled, and iced; or with colored sugar sprinkled onto the iced bread. Traditionally, Russian families brought their Kulich loaves to church to be blessed before the bread was served for the Easter celebration. The bread was also baked for Remembrance Monday, a Russian religious observance similar to All Souls' Day. Description: A tall, dome-shaped yeast bread that originated in Milan, Italy and is served on festive occasions, especially Christmas. 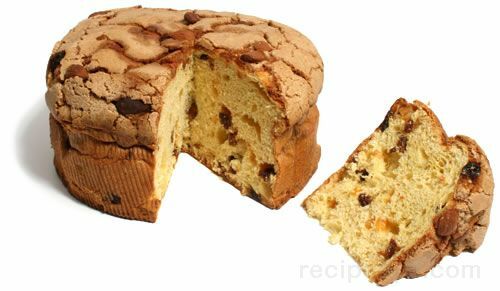 Panettone is enriched with eggs, butter, and milk, sweetened with sugar, and flavored with raisins and orange and lemon zest. It is usually baked in a tall, rounded mold such as a tall cake pan lined with parchment that extends above the rim of the pan or even a deep saucepan lined with parchment. 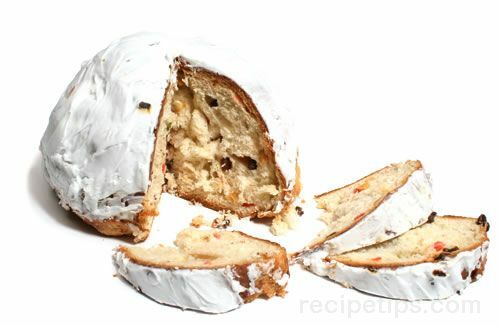 There are several variations of the basic panettone recipe with some calling for candied fruits in addition to the raisins, or cocoa powder or chocolate, while other variations may contain nuts. Powdered sugar is occasionally sprinkled on top as a decoration. The original name for panettone was "Pan di Toni," or "Pan di Tonio," meaning "Tony's Bread," based on the legend of a Milanese baker, Tony, who invented the bread. Description: A German festival bread that is popular during the Christmas season not only in Germany, but in many other parts of the world as well, especially other European countries and parts of the United States. 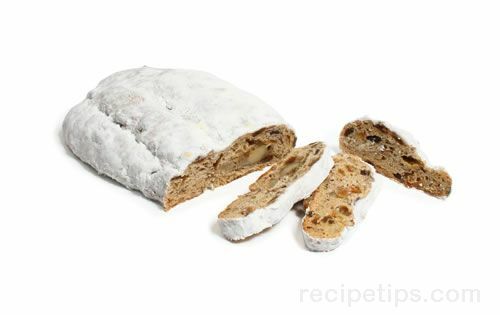 Stollen is a rich yeast bread that is loaded with currants and raisins that have been soaked in rum and is also flavored with lemon zest, cardamom, candied peel, and almonds. The bread is shaped into a long oval that is tapered at the ends to symbolize the baby Jesus wrapped in swaddling clothes. The dough is often rolled around a center filling of almond paste made of ground almonds, sugar, and a bit of egg and lemon juice. Some recipes omit the almond paste center, but instead call for chopped almonds to be incorporated in the dough. The bread is often dusted with powdered sugar before it is served. Stollen is also known as Christmas Stollen, Christollen, and Dresden or Dresdner Christollen after the city of Dresden, Germany where the bread originated. Description: A Spanish yeast bread that is traditionally served on the eve of Epiphany (Twelfth Night). The dough is enriched with butter, milk, and eggs, flavored with orange and lemon zest and brandy, and topped with candied fruits and flaked almonds. It is formed into a large ring shape and baked until golden. It is the custom to insert a dried bean, small coin, or figurine into the dough before baking. Whoever receives the slice of bread containing the bean is declared king of the Twelfth Night festival and is the person designated to make the bread the following year. A similar recipe known as "Bolo-Rei" is the Portuguese version of the bread.